When life hands you tomatoes, make salsa. That’s what Marcy Mydlak did years ago when her mother-in-law gave her 25 pounds of tomatoes, and she’s been going with the flow ever since. Her salsa-making went from a weekend hobby to a business in 1999 when the plant she was working for shut down. 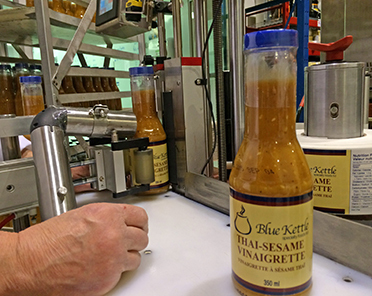 Her sister Carol Olivieri had recently left her job, so Marcy convinced her to help for a six-month trial period, and Blue Kettle Specialty Foods Ltd. was born. Carol admits she was skeptical about working with family at first. She signed up for six months thinking, “I’m going to get a real job after this,” she says. But when the duo debuted the salsa at the Grandin Park Plaza indoor market in St. Albert, Carol was hooked. “We sold 42 jars of salsa and we were thrilled,” she says. Soon customers were offering up suggestions and wish lists, so the sisters began developing new products like the ever-popular chili base that’s already been simmered to perfection; all you have to do is add meat and serve. Other products are multifunctional: use the citrus peppercorn vinaigrette as a marinade for chicken and fish, slather the Greek dressing on roasted veggies or add the number-one selling ginger dressing and dipping sauce to your sautéed prawns, barbequed salmon and rice. “We wanted to bring out products that were a little out of the ordinary,” says Carol, explaining that not all customer requests made it past the chopping block. Appeals for Caesar dressing went unanswered for some time, until Marcy married the classic condiment with flavourful Parmesan and Asiago cheeses for a creamy, full-bodied taste. Besides being out of the ordinary, Blue Kettle products are also made with less water than many other brands, and most of the products are naturally gluten free. 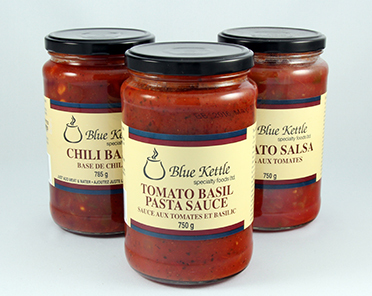 Talking upstairs in Carol’s large-windowed office above the production room, two things are clear: she is very passionate about Blue Kettle products, and she really loves working with her sister. From sharing the same favourite colour (blue, of course) to their commitment to recycle even though it means taking plastics into Edmonton, the siblings seem to be on the same page. They even share their holidays together at their favourite place on Earth – Disneyland. “Sometimes we even bring the kids,” says Carol with a smile in her eyes.